This year marks not only the first time the FIFA series will feature women’s teams (in the form of 12 national teams) but also the first time a female athlete has graced the cover of a mainstream sports game. FIFA is one of the best selling video games in the world, so it’s pretty cool to see a female athlete featured predominantly on the cover and it’s even cooler to see the women’s national teams make it into the game. Hopefully this is the first step of many to expand the focus beyond just male athletes in EA Sports games. I really like the cover, featuring Alex Morgan of the United States national team. I’m honestly a little tired of seeing Messi on the cover, I think they could’ve given Morgan the cover on her own to celebrate the women’s team World Cup victory. 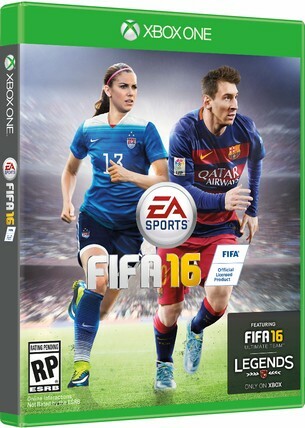 I’m excited for FIFA 16 to release this Fall, and I can’t wait to see this cover in my digital game collection. Congratulations Alex Morgan! This entry was posted in Video Games and tagged Alex Morgan, female athletes, FIFA 16, fifa 16 cover, video games, women, women in video games, womens teams, Xbox, Xbox One. Bookmark the permalink.